Tap the Plus button in the Outfits screen to create a new outfit. Draw loosely around each product you’d like to feature in the Outfit. If you want to re-draw or delete a product, swipe left on the product row to delete and try again. Type a name for each product, or scan a barcode by tapping Scan. Choose which Video Presets and Photo Presets you want to use for the Outfit. The system remembers your selections from the previous outfit to save you time. Tap Start to enter the Composer screen. The Composer screen is where you spend most of your time when using StyleShoots. It is here that you record videos, take photos and review captured content. On the left side of the screen is the Gallery. Each Photo and Video Preset has its own section, marked by a vertical line in the left margin. The content of each preset appears within its section, so you always know what’s what. On the right side of the screen is Live View. Live View changes appearance depending on whether you are shooting videos or photos, and depending on the aspect ratio. When you review captured photos and videos, they appear on top of Live View. StyleShoots machines come with a world class lighting system where you can adjust light and exposure with a touch of your finger. Tap the Light icon in the upper right corner of Live View to reveal the light drawer. Tap the preset numbers you want to modify - or go directly to step 3. Slide your finger within the rectangular fields to modify the light. Move your finger along the middle of the rectangle to keep the balance straight and only modify intensity. Move your finger towards the ends of the rectangle to modify the balance. The top and side lights can be altered for both intensity and balance. The bottom light can be altered only in intensity. Use the exposure slider at the bottom of the screen to alter the camera exposure. To prevent accidental changes, tap the Lock icon. Locked presets are marked with a white outline in the light drawer at the top of the screen. Tip: Make and save a few light presets and use them again and again for consistency. StyleShoots will automatically re-focus on the center of the image whenever the camera has moved to a new framing preset or has prepared for a video recording. Tap anywhere on Live View to focus on that area. Once you tap, a white square will appear during focus, and turn green when focus is done. If the system can't focus, try tapping a nearby area with more contrast. To record videos, select a Video Preset in the Gallery. You can tap on its name, or on the vertical line in the left margin. Live View changes to the right aspect ratio and shows the list of clips in the preset. Tap a shot in the Shot List on the right side of Live View. The section expands to reveal details about camera framing and camera behavior. The camera automatically moves to the right starting position. Tap the red Record button. The system counts down and starts the recording. The model should start moving prior to the start of the recording for a natural appearance in the final video. Once the shot has been recorded, a green check mark appears and a dot on the video strip is filled in. Tip: If you are unhappy with a particular shot, you can re-record it. Tap and hold the green checkmark to toggle it into a record button. Then, tap the Record button to discard the original recording and make a new one. If you have marked multiple products during Outfit Creation, you will see multiple versions of the same Video Preset in the Outfits screen. In the upper right corner of each preset you can see the name of the product that will be featured in the video (see section below). Video strips in the Gallery show a dot for each shot in the video. When you select a shot in the shot list in Live View, the corresponding dot will be highlighted on the video strip. If a shot is going to be reused across multiple videos, it will be highlighted in both video strips (see example image above). This depends on which video template you are using, and only applies for shots that don’t change depending on the product’s location in the scene. It can be hard to remember each product by name. When you have multiple product in each outfit, it’s important to know which video belongs to which product. Tap and hold the product name at the top right above a video strip. A thumbnail of the product appears so you can see which product is in focus. Release your finger to close the popover. Select a photo preset in the Gallery to start taking photos. Live View updates to reflect the list of framings and the aspect ratio. Use the Framings feature to quickly move the camera between predefined positions. You can fully configure your own Framings in Settings, and adjust them in Live View. Tap a framing preset in the Framings list on the right side of Live View. The camera quickly moves, tilts and zooms to the preset positions. Tap the model to focus. You must re-focus whenever either the camera, lens or model have moved. Tap the Photo button to take a photo. You will see the photo appearing in the Gallery on the left side of the screen. Tip: Tap-and-drag the Photo button to place it in a comfortable position for you to easily tap it repeatedly, even without looking at the screen. If a photo or video framing needs to be tweaked, you can adjust camera elevation, tilt and zoom by using gestures in Live View. Select the photo framing or video shot you want to adjust. Let the machine move the camera into its predefined position. Swipe up/down to move the camera vertically. Swipe up/down with two fingers to tilt. A Save Changes button will appear. Tap it to have your changes saved as the new default for that photo framing or video shot. Tip: You can do a one-off adjustment without saving your changes. Just tap the record button or photo button and select a new framing or shot without saving your changes. Once all the shots for a video have been recorded, the video will auto-complete and become available for review. Tap the video you want to view. The video auto plays in a loop on the right side of the screen. Swipe down on the video to exit review mode or tap another item in the Gallery. Tap a photo in the Gallery on the left side of the screen. It will then appear on the right. You can pinch to zoom in and out. Swipe left or right on the large photo to browse. Tap-and-slide across images in the Gallery to quickly scan through many photos. Swipe down on the right side of the screen to exit review mode. 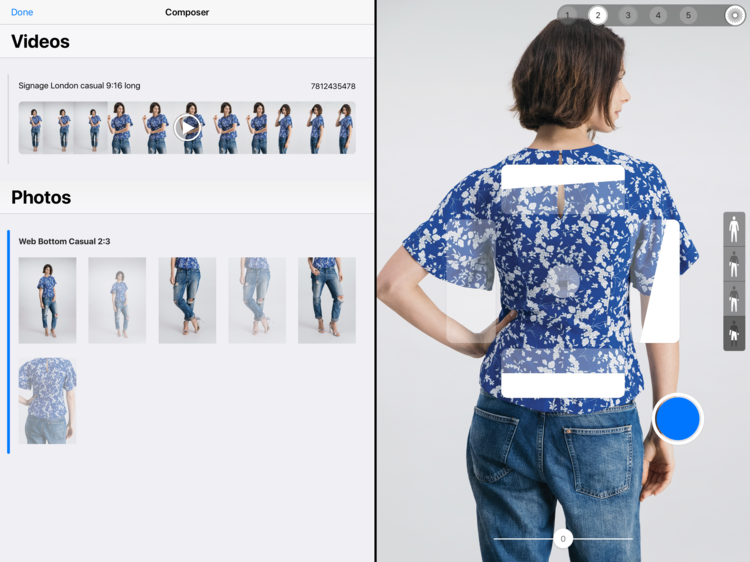 Tip: To compare a detail on two different images, tap the first one and zoom in on the detail. Then tap the second image. The zoom level and focus area are retained to allow easy comparison of for instance a facial expression or product detail. After taking a lot of photos during a session, you can select which ones to keep and which ones to discard. Images marked for deletion will be permanently deleted once you do an Export. Tap a photo in the Gallery to view it large. Tap the blue checkmark in the lower right hand corner to mark it for deletion. Images marked for deletion are shown as faded out in the Gallery. Tip: Swipe up on the large image to toggle it between marked for deletion and marked for export. So you don't have to tap the checkmark in the lower right hand corner.